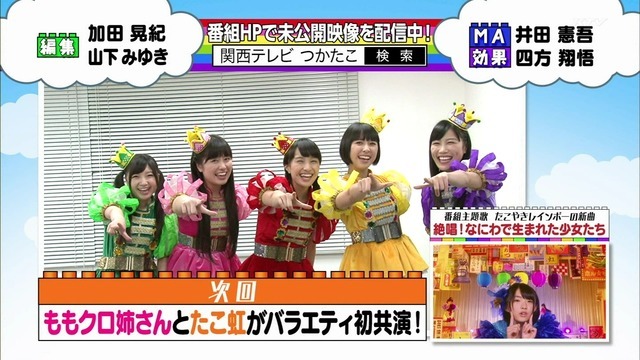 Momoclo will appear on Tsukatako #8.
ah the player doesn't work, can you enable download permissions? 3. Shout something on the roof of Harukasu (Abeno Harukas Tower)!? Edit: 2015/01 The videos are down now due to copyright claims and will not be re-uploaded since I want to keep that account..
Added YouTube links to my previous post. They're having 3 shows at BIGCAT, each 61 minutes long, and they're having some interesting caveats with it that they're just now finding out about in the video. 1. The setlist will be determined by random draw from all songs after the show begins (It will not be decided in advance for any of the three performances). 2. They will have one opportunity to take a break for each show of their choosing, which they will have to determine as the show progresses. 3. If they can finish the 61-minute show without any incidents, they will finish the show with Rokko Taco Oroshi. Mezase Kousien! Tsuka Tako Rainbow Road(CS) is scheduled to start on September 19.